Pocket Money and House Work – To pay or not to pay? Do you climb Mt Laundry as often as I do? This is my Rosella sitting on top of Mt Laundry. It was a big climb up to the top and it was heaps of fun, before it exploded in a lava flow of clean clothes. Mt Laundry has an uncanny ability to erupt and re-build itself several times a week in this house hold. With two families living here, and six children, one of whom is in cloth nappies, the washing machine goes two, often three times a day. Our verandah is very rarely seen without a colourful display of clothing pegged to the wire fence. 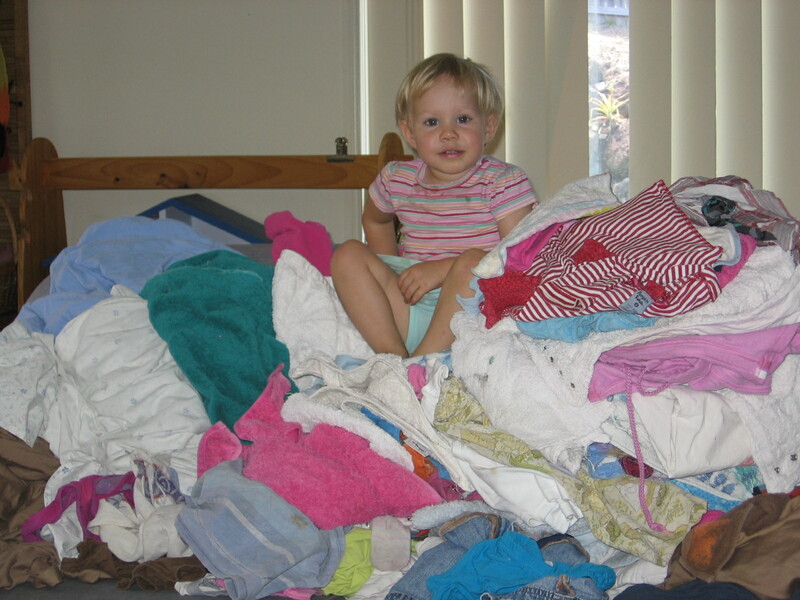 I don’t mind folding laundry, but I do mind how often it needs to be folded, and some days I feel like I will never reach the peak of Mt Laundry at all. The children are well able to sort out their own clothes and at seven years and almost-four years of age they can do a fair job of folding their own clothes and putting them away, and jobs like this have by necessity become a daily event. Money for ‘treats’ is the thing for the oldest children in our house at the moment, but I am in a dilemma about whether to pay pocket-money for household jobs or not. My feeling is not to pay for things like doing the laundry, cleaning bedrooms, sweeping etc. My kids have their daily and their weekly jobs: before breakfast they make their beds and tidy the floor of their room. They tidy the playroom before dinner, and sort out their clothes at the end of the day. On the weekend they help to tidy the house by cleaning their bathroom, vacuuming their carpet and tidying the verandah. My feeling is that these tasks should be shared because they are a part of caring for our home, and as we all live here then we should all participate in the caring, and this should not be rewarded with money. Besides, I don’t get paid for house keeping, so how can I out-source this?! I really don’t want participation in household jobs to be reliant on how much the job is worth. But I am prepared to pay for jobs that are not daily or weekly things. My son has earned his treat money for his school market day by dusting and vacuuming the inside of our car. He worked so hard and so diligently, and is so proud of his job. 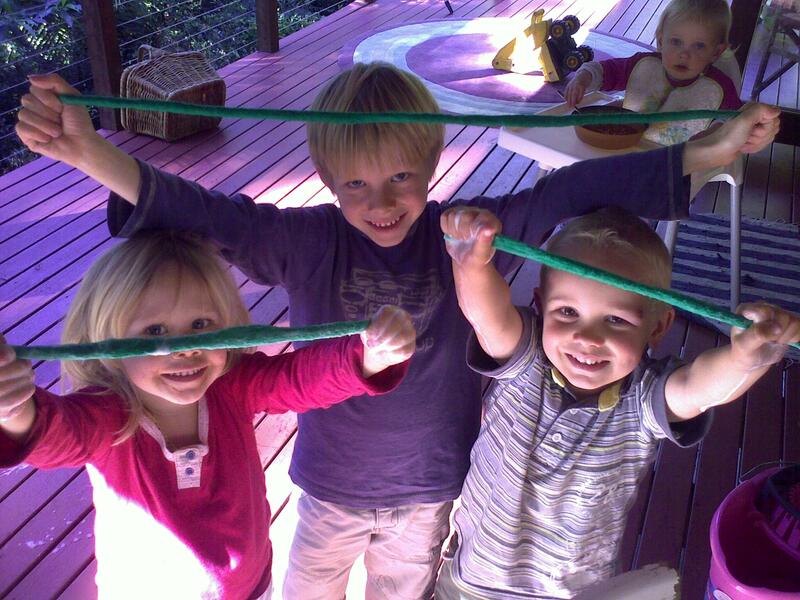 I’ve also got school holiday boredom sorted by offering to pay children to roll felt balls and felt strings for me. I can use the felt for my craft and my felting business, and the work is wet, soapy and perfect for hands that need to be kept busy. I’d love to hear your thoughts on the matter, and how you manage pocket-money with your children at home. ← Two steps forward, one step back! I worked on the same premise that you have….we all live in this house therefore we all care for it (except there was just my daughter and myself – not as much mess, but not as much help either). I decided to give my daughter a small amount of pocket money ($5 I think) when she was about 7 or 8 (she’s now 24 so it was a reasonable amount of money but not a lot). But at the same time I stopped buying things for her when we went out (not that I bought a lot, but there was the occasional ice cream, milk shake etc) and she could use it to purchase from the school tuckshop if she didn’t want to take her lunch. Part of the reasoning for this was so I knew how much I was pulling out each week rather than pulling out $2 for an ice cream when we went shopping, money for a magazine another day, money for tuckshop another day; then there was money for school activities or “gold coin” for free dress days etc. I gave her the pocket money and she paid for her own needs. Naturally there was some discussion beforehand to help her understand how to manage the money. At first she decided $1 would be for her to “splurge” usually something insignificant from tuck shop, $2 would be for things that might come up (gold coin days) and $2 would be for considered purchases (minor saving). There were opportunities to do extra things which attracted money too (helping in the garden, cleaning the car etc). As she got older I increased the money but expected her to pay for some of her clothes. By the time she was 12 if she needed new clothes and she selected a top (for example) that was more than I was willing to pay then I expected her to use her pocket money to add to it The idea came from my daughter actually because I said I’d only pay $10 for basic tops rather than $25 for brand names and she desperately wanted a brand name top – she asked if she could have it if she paid the difference. I agreed and we decided that’s what we’d do from then on. Once she began part time work (@14 1/2) I gradually stopped buying non-essential clothes for her and she bought them. So I purchased uniforms, underwear, PJs etc. and she took on buying her other clothes and I stopped giving her pocket money. Once she left school I expected her to purchase personal care products and pay board. She’s great at budgeting and gets the most out of her money now! But everyone is different and you have to work out what works best for you. Consider asking your children what there thoughts are on it; or given them some options and see what they pick.